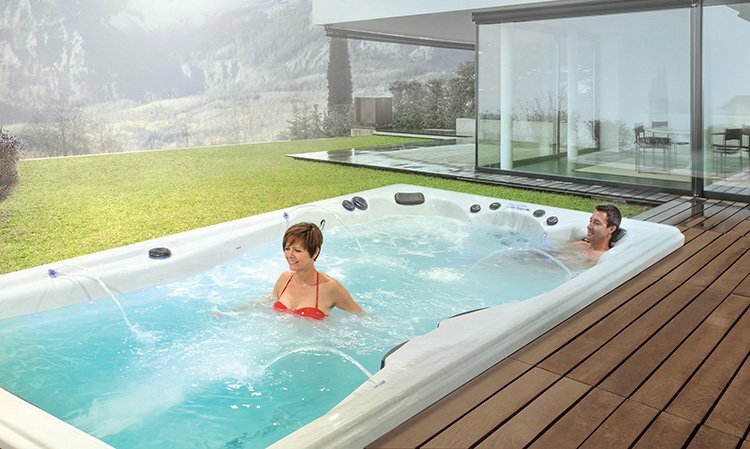 Our Swim Spas Store is Packed with Premium Fitness Spas and Hot Tubs. If you have been thinking about getting a swimming pool, but don’t have the funds to afford one, then you should look into a swim spa!. 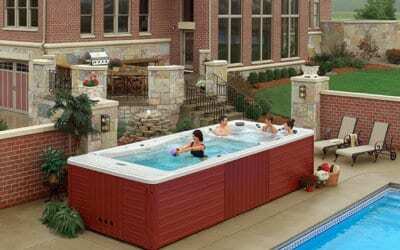 A swim spa is fundamentally a smaller type of a pool and can come in different sizes according to what you want. Typically swim spas are approximately about 12 to 24 feet in length. Fitness pools allow you to swim in place and work your body in a different ways than swimming laps in a regular sized pool. 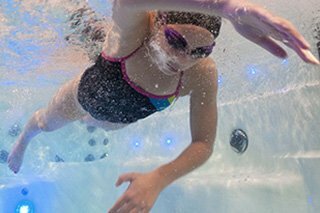 Swim spas are great for those who want to focus on water fitness such as underwater running rather than incurring the cost of a swimming pool. When a swimming pool is too costly, then a swim spa is the best route to go. Our swim spa retail store is located near Cleveland OH, and we have a diverse selection of swim spas! 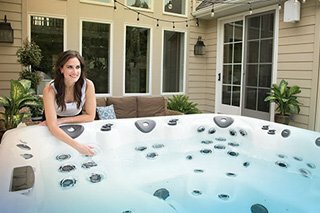 Learn more about Michael Phelps Signature Series Swim Spas by Master Spas. These incredible Swim Spas were created with input from 23-time gold medalist Michael Phelps and his coach for training, swimming, fitness aquatic therapy. Introducing the H2X® premium jetted fitness spa, providing an incredible experience all day. The H2X premium fitness spa provides appealing styling and features that include many premium advantages over the competition. "The swim spa looks AWESOME!" "Bought a swim spa a few months ago and just got the deck done and took delivery last week. 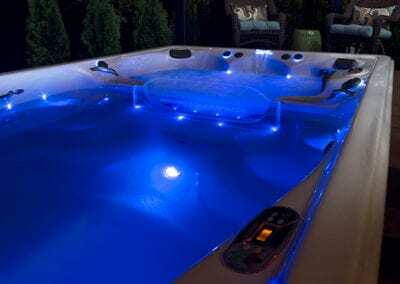 The swim spa looks AWESOME with the deck surround and it’s great to relax in in the evening. Really lights up pretty at night." Swim Spas also known as exercise spas allow you to constantly swim against a current, it’s similar to having a personal trainer! Swim spas allow you to focus more on improving your health, by swimming against the current! Instead of investing in a swimming pool. By choosing a fitness spa, you can swim without doing laps in a regular sized pool. Instead, you swim against the current, which allows you to build up your stamina as you swim. Our swim spas act as a personal swim trainer, and will help you exercise regularly on your own terms! 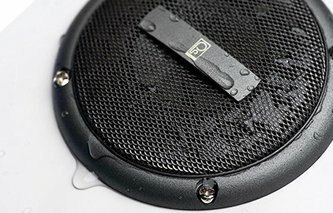 Come visit us at Leisure Time Warehouse, we serve the Cleveland area, including Cleveland Ohio, and are excited to offer these unique products. Click on an Image to View Our Exercise and Swim Spa Gallery! Swim spas are also a productive investment because you get the best of everything; strength training, swimming, underwater running, and water aerobics! 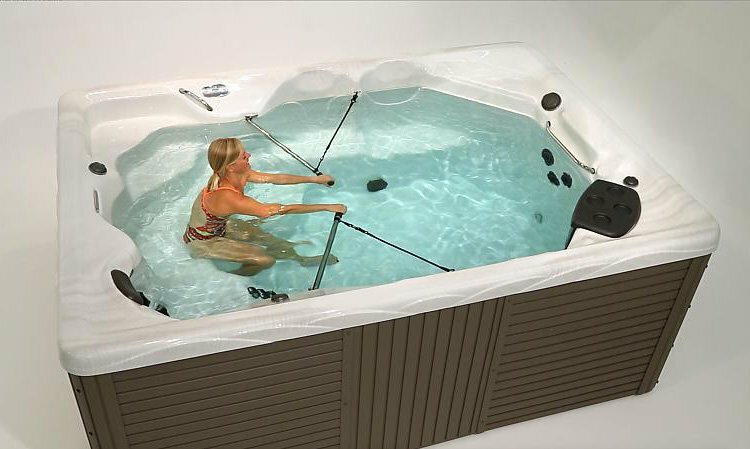 Exercise pools are a great way to relieve the stress you carry with you from a long day? Fitness spas / swim spas are able to help you with relaxation by allowing your body to become more physically fit. 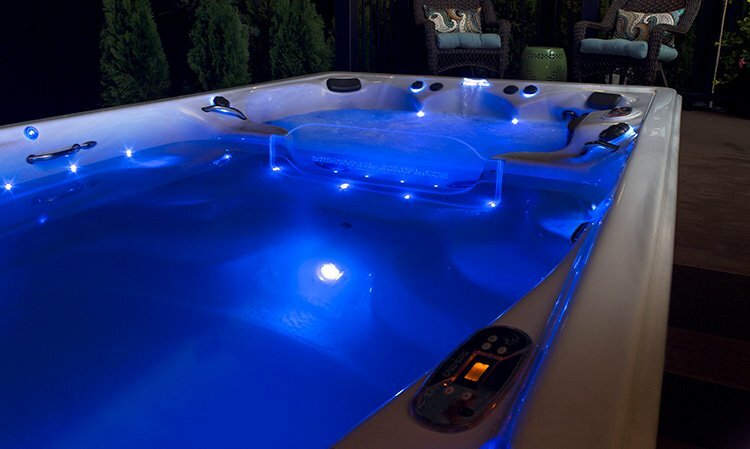 At Leisure Time Warehouse, serving Cleveland OH, we sell premium swim spas, hot tubs and more! If you are in search of an exercise spa, such as the Michael Phelps Signature Series Swim Spa, you have found the right place! Stop on by and see what can be yours. Our swim tubs have many features including stainless-steel hardware, therapy seating, and exercise equipment. Our swim pools offer our attractive styles that are visually appealing for any backyard environment. 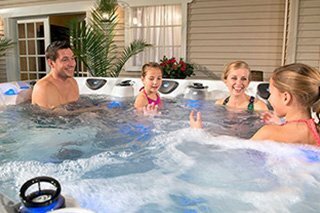 When you visit Leisure Time Warehouse near Greater Cleveland, you’re able to take advantage of swim tubs, and hot tubs for a great price. 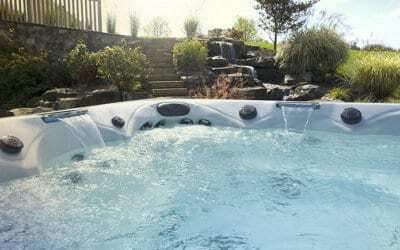 As a high-end luxury provider of swim pools and hot tubs, we make sure to identify anyone’s needs when it comes to finding the right swim spa that’s affordable. 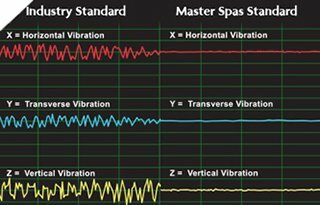 Some of the swim spa products we offer are the Master Spas® MP Series and Michael Phelps Signature Series Swim Spa. Some of the benefits include the Xtreme® Therapeutic seating and stereo system, so you are able to own a high-performance swim spa. Call us today and discover why we are Ohio’s best swim spa store! 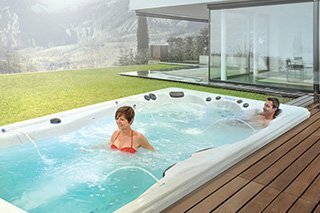 Our Premium Swim Spas Offer Numerous Features, Many Spa Features are Standard! Below are sample features that are built into our quality fitness and exercise pools! Some features shown below are optional and are not included with every swim spa. Please consult our friendly sales consultants for details. 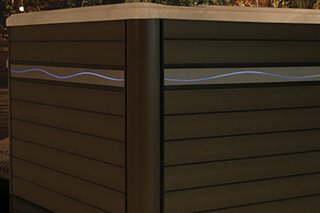 Thanks to the H2X line, you can enjoy the full-body effects of aquatic exercise right in your own backyard. Experience the ultimate backyard fun center. The H2X line is the perfect place for a family get together! 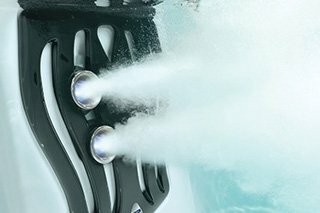 Our exclusive Xtreme Therapy Seat and Xtreme Therapy Cove deliver the ultimate in hydrotherapy. The H2X line gives you the energizing benefits of swimming any day of the year. 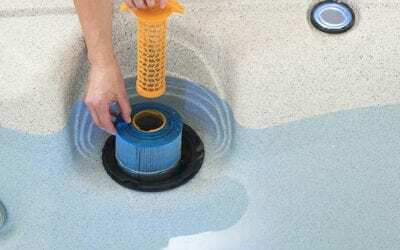 SoftTread™ Swim Spa Floor System by SwimDek® is a premium option that provides ultimate in traction. Our roll up Axis Cover System is a premium option that makes it easy for anyone to handle their swim spa cover. 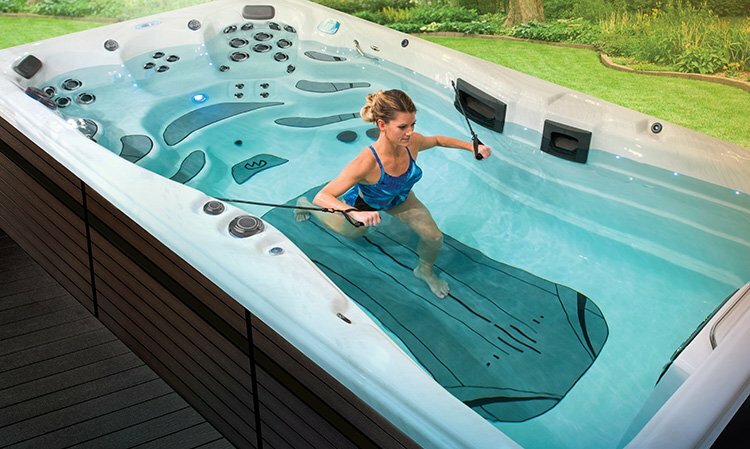 The Fusion Air Sound System is optional on all swim spa models. High tech polymers make maintenance easy. 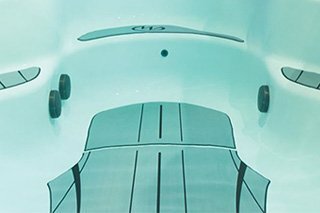 VIP Technology ushers in an entirely new class of jetted swim spa – the HD swim spa! Master Spas’ patented EcoPur® Charge Water Filtration System minimizes maintenance while providing crystal clear water. 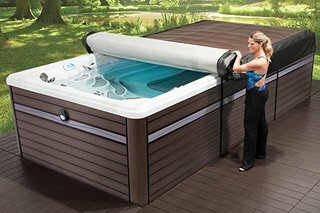 We build our swim spas to be used year-round in every possible climate using environmentally friendly Icynene foam insulation. 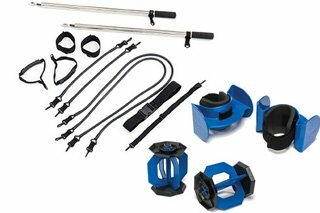 The H2Xercise System includes H2Xercise Bells, Fins, Rowing Kit and Resistance Bands and comes standard with all models. Check Out Our Swim Spa and Fitness Spa Blog! What Are the Exercise Benefits of Aqua Therapy? 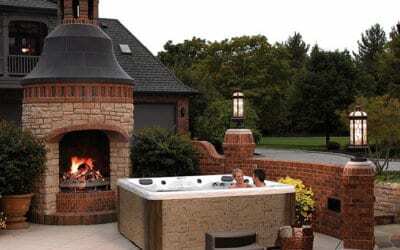 Hot Tubs, Pools, and More! 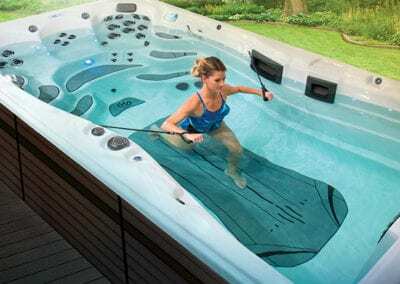 LeisureTime Warehouse carries premium Swim Spas, hot tubs, pools, and more. Build your dream backyard today! Our swim spa retail store is location in Ohio and offers: hot tubs, swim spas, swimming pools, in-ground swimming pools, above-ground swimming pools, hottubs, saunas, new pool installation, pool construction, pool contractors, hot tub installation, hot tub retail store, Michael Phelps Swim Spas, twilight hot tubs, clarity spas, healthy living hot tubs, H2X swim spas, Michael Phelps Legend Series hot tubs, and more! 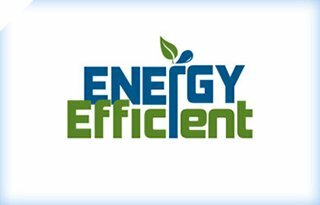 Service Areas include: Wickliffe OH, Cleveland OH, Cleveland Heights OH, Mayfield OH, Mayfield Heights OH, Chesterland OH, Eastlake OH, Chardon OH, Middlefield OH, Painesville OH, Timberlake OH, Euclid OH, Parma OH, Kirtland OH, Kirtland hills OH, Mentor OH, Beachwood OH, Maple Heights OH, Willoughby Hills OH, Willowick OH, Richmond Heights OH, Willoughby OH, Waite Hill OH, and Beyond.